A couple months ago, my new friend Erika (check out her blog!) interviewed me for UWeekly to be one of her weekly streetstyle subject. One of the questions? "UW: What trend would you never be caught dead in? Me: Huge fur vests/jackets! They look cool on the runway/Kim Kardashian, but I just cannot think of a situation in my life where I could wear one and not look ridiculous!" But now, merely weeks later? 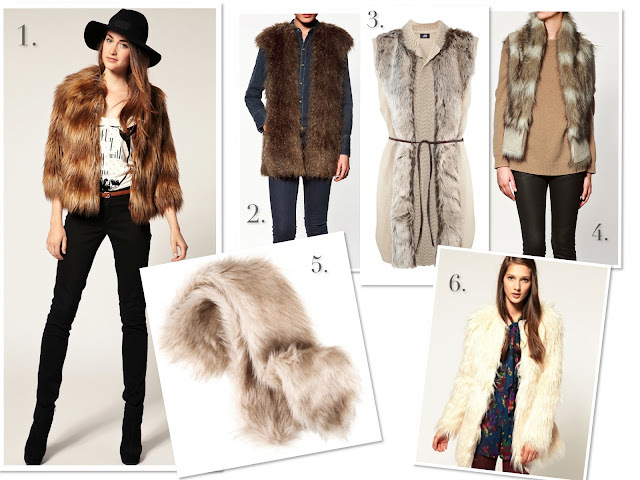 A few of my favorite bloggers and some style spotting in real life has me changing my tune on these furry accessories. Never say never on trends, people! Here are some of the fur babies I've found at some of my favorite online spots. I hope all of these are faux furs! I hope NONE of these are squirrel furs. . .